Departing from INFLITE, Rosedale, take in views of Rangitoto Island and the Hauraki Gulf before heading South East via the Firth of Thames towards the Waihi Gap. Soak in views of the beautiful stretch of East Coast beaches along to Mount Maunganui and Tauranga before tracking off the coast and landing within the living, active geological giant - Whakaari (White Island). Once you land at White Island, your pilot will provide you with your safety equipment and a briefing. Enjoy informative commentary from your pilot / guide while walking around this Moon like crater floor. 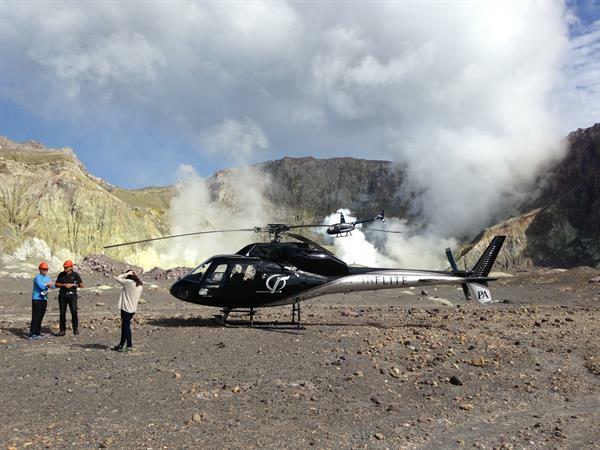 After exploring White Island, your pilot will transport you to Whakatane to land for fuel and a relaxation break. Once refreshed, fly on to one of the many lunch stop options including, secluded beach picnic, Mills Reef Winery, Tauranga Airport Classic Flyers Museum or one of the many luxury central North Island lodges. After dining, your pilot will transport you back to INFLITE heliport, Rosedale to complete your day. Helicopter transfer to White Island. Safety briefing and safety equipment. Enjoy informative commentary from your pilot at White Island. Includes one of the many scrumptious lunch stop options. Add on additional flight time over the pine forests and the spectacular Tarawera Falls, Lake Tarawera and the volcanic rift of Mount Tarawera. This experienced can be combined with a 1 way or return overnight package at a number of the luxury lodges in the central North Island or further afield.